If the British royal family thought the wedding of Prince William and his new bride would wash away the last remaining vestiges of controversy surrounding their treatment of Princess Diana they were very much mistaken. 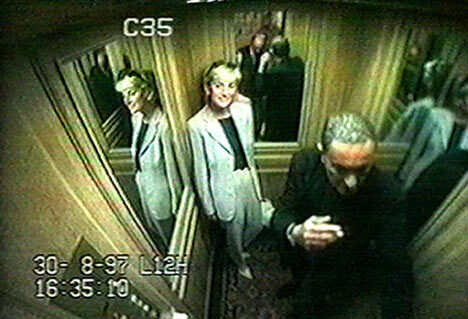 Just as word comes that William and Catherine are blissfully enjoying their honeymoon, a new documentary unspooled at Cannes this weekend alleging that Princess Diana was murdered as the result of a plot that was hatched behind the walls of Buckingham Palace. The film's premiere comes at a time when the royal family was likely breathing a sigh of relief that the public seems to have put the scandal-ridden Diana era behind them and embraced Prince William and Catherine as the hopeful, non-controversial future of the monarchy. While the world is fascinated with the royal honeymooners it's plainly obvious the origins of our interest lie in the couple's connection to Diana. Their story is the next chapter in her story -- the one that was cut short when she died on that fateful summer night in 1997. The wedding was indeed the fairy tale spectacular that the public -- and the royal family -- had hoped for. The royal couple, who did not seem all that fascinating during their engagement, completely captivated us for their wedding. A new, blessedly scandal-free chapter on the British royals had begun. The debut of director Keith Allen's (father of pop singer Lily) controversial documentary, Unlawful Killing, which raises the issue that Diana's death may not have been an accident but may, in fact, have been murder, brings Diana back into the forefront reminding everyone that the most sensational figure of Britain's royal family does not have be alive to be the most compelling figure of the group. The truth is she is even more fascinating in death than she likely would have been in life at this particular time. If she lived, chances are Diana either would have been living abroad (she had been looking at houses in California the summer she died) and settled into a life focusing on her charitable causes or she would have made some spectacularly bad choices (like a marriage to someone like Dodi) which would have prevented her from having much regular contact with the royals. Her strong relationship with her sons, particularly William, would have prevented total banishment but either way, she would not be the beloved icon she is today had she lived. That kind of reverence is reserved for those who die an untimely, tragic death at the peak of their promise and beauty. Unlawful Killing brings it all back. Those frenetic last few days spent in Paris. (I've always wondered what she was thinking -- what wealthy person that has everything at their disposal goes to Paris in August?) The unlikely romance that seemed to bloom out of nowhere since Diana was madly in love with Pakistani heart surgeon Sr. Hasnat Khan up until the minute she met Dodi. That fateful night at the Ritz where the couple inexplicably decided to leave the security of the hotel despite the presence of the scrum of paparazzi who were waiting to follow them into the night. The documentary resurrects all the details about the night that still leave many people with the uneasy feeling that the truth about what really happened has yet to be uncovered. While the film reexamines the questions surrounding what happened that night it also raises others about the intent behind the film. Mohamed Al Fayed, father of Dodi Fayed, who was killed with Diana and has long claimed that both his son and Diana were victims of a nefarious plot headed by Prince Philip, is the film's producer. In it, he is depicted as a man dealing with such profound grief that he can not sleep in any of his mansions preferring to live in a tent near Dodi's grave. His claims that the couple was killed because they intended to marry and the English establishment would not allow the mother of the future king of England to marry a Muslim are given another airing and the portrait that emerges of him is of a man profoundly mired in his own emotions and understandably devastated by what's happened. In 1993, Diana wrote a letter to a friend predicting her own death would occur as a result of a car accident "clearing the away" for Prince Charles to marry. She also gave a letter to her then butler Paul Burrell to be opened in the event of her death which stated if she died under suspicious circumstances her ex husband should be held responsible. Numerous friends including former British tabloid editor Piers Morgan are interviewed in the film giving their reasons as to why her death may not have been an accident. One of the most unsettling details about the events surrounding her death is also re-examined. On the night of the crash, all of the cameras in the tunnel, which are ordinarily on 24/7, were turned off. The official inquest, longest and most expensive in British history, concluded the deaths of Diana and Dodi to be the result of a drunk driver. Their chauffeur that night Henri Paul, who was also killed, reportedly had a blood alcohol level three times the legal limit. Allen's point in making the film is: How can a judicial body called the Royal Court of Justice be trusted to tell the truth about the event which involved the most problematic ex-member of their family? More than anything else, the film is a reminder of a very dark time in the history of the British royal family when the world saw how the fairy tale (that never was) turned into a horror story once the world's favorite royal was banished and left to flounder outside without the protection of their inner circle. Looking back on those months leading up to her death, Diana clearly was on a collision course with fate and one way or another was going to ignite a controversy for the family that wasn't going to be easily resolved. Stripped of her HRH title and having to navigate the difficulties of sharing her young sons with Prince Charles, Diana was left to forge a life for herself for the first time since she was a teenager. There is no doubt she made some bad choices that summer. How directly they led to her death remains a question that I think will never be satisfactorily answered for some royal watchers. A few weeks ago, we all believed in fairy tales -- at least for a few hours when we saw Diana's son walk down the aisle of the same cathedral where the world had witnessed her funeral. We saw her son marry for love, not duty. We imagined how proud she would have been. We saw another young woman walk into the church an outsider and walk out a royal. Would Diana have approved? How would she have felt about sharing the spotlight? Would she have had a new husband to stand with opposite Charles and Camilla? After causing such controversy with her divorce from Charles, would the family have made peace with her? "Unlawful Killing" will clearly benefit from our collective renewed interest in the British royals which in and of itself feels more than a little opportunistic. It is no coincidence that its premiere at Cannes happened two weeks to the day after Prince William's and Catherine's wedding. Knowing how much William has struggled to live with the series events the culminated in the death of his mother and how much he wanted to make Diana a meaningful part of his engagement by giving Catherine her ring only engenders sympathy not suspicion for at least two members of the British royal family. It's hard to imagine that anyone living in Buckingham Palace would have a hand in anything that would bring such heartbreak to William and Harry. But yet, the simple truth is everything is much easier for the royals without Diana. With her gone, no one is going rogue and telling tales from behind the palace walls. (Sarah Ferguson's sad attempts to trade what little ties she has left to the royals were simply the pathetic actions of a lost soul still looking for their approval -- she even told Oprah as much) As a result of Diana's death, Charles was able to marry Camilla just as Diana predicted. So, depending on what you believe her death was either the result of one of the most sinister plots ever carried out or an just incredible coincidence. All I know is just when we thought we'd witnessed a fresh start for the British royals, Diana will not let us forget her. As she told Piers Morgan, she won't go quietly.